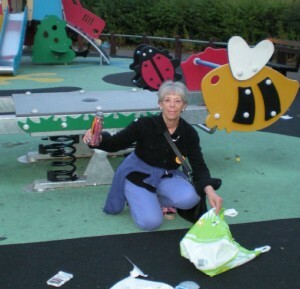 Vanessa McPake had the bin emptied and the litter collected at the Abbeydore play area, Monkston. “These bins must be emptied more often!” she said. 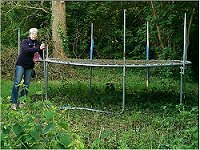 We expect to find the odd discarded toy – but Cllr Vanessa McPake was amazed to find a trampoline discarded in Walton Park recently! And nearby, Cllr Jenni Ferrans found the dog bin being used as a litter bin too! The Focus team have asked for both to be cleared. Jenni Ferrans finds a dog bin doubling as a litter bin in Walton Park. 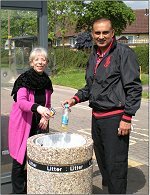 The Lib Dems have just got a litter bin installed by the well used bus shelter in Dunchurch Dale, Walnut Tree. Local residents have said “well done”. That’s the message from the Lib Dem Focus team to the Tory-run MK Council. 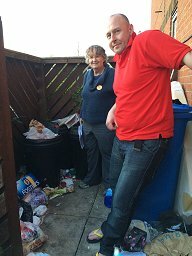 The Lib Dem Focus Team has asked the Council to inspect the store at Birdlip Lane flats, and to make sure teams clear up when sacks burst. Litter – We Need Action! The Lib Dem team collect more litter in the playground at Pipston Green, Kents Hill. They have now asked the Parish Council to install a litter bin for kids and families to use.